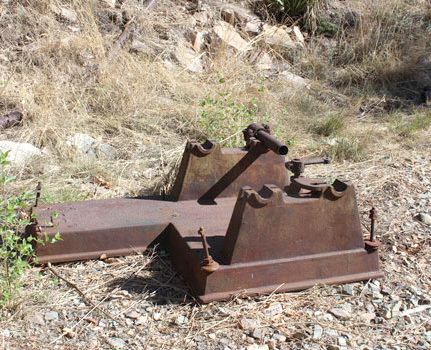 I was recently asked by a friend if I had any idea what an old piece of mine machinery might have been that he had come across at a minesite down in the Huachuca Mountains. I had to reply that I was pretty much clueless, but I did recognize the name " Albert Steinfeld & Company" that was cast into the base. I knew that Albert Steinfeld had been the owner of a large department store called "Steinfelds" in downtown Tucson. The question that came to mind was why was the name of a department store company cast into a piece of old mine equipment? 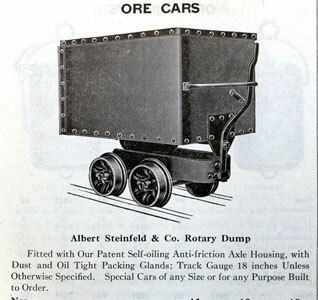 It was evident that some research into the Albert Steinfeld Company was needed. It turns out that there was so much more to this company than just a department store! Albert Steinfeld came to Tucson in 1872 when he was 17 years old to work for his uncles Albert and Luis Zeckendorf in their mercantile business. By 1878, he had risen to the position of partner and was the acting general manager of the company. In the early 1900's, Mr. Steinfeld purchased the business from his uncles and changed the name from L. Zeckendorf & Company to Albert Steinfeld & Company. 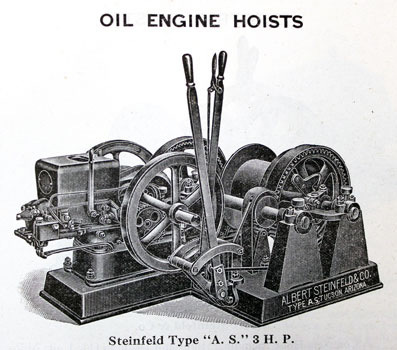 The Albert Steinfeld & Company involved itself in many types of commercial enterprise. In addition to the department store, there was a retail grocery business, a brick manufacturing company, a wholesale liquor business, and a wholesale hardware sales operation. The company owned farms, and ranches. In 1910, Steinfeld became the president of the Consolidated National Bank. He then developed the Pioneer Hotel and donated the land for the VA hospital. 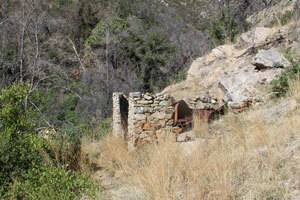 Steinfeld was very active in the development of mining properties at Bisbee, Ray and Silverbell. He was also involved in smaller mining operations. Two of those were the Mowry Mine south of Patagonia, and the Alto Mine near Salero. 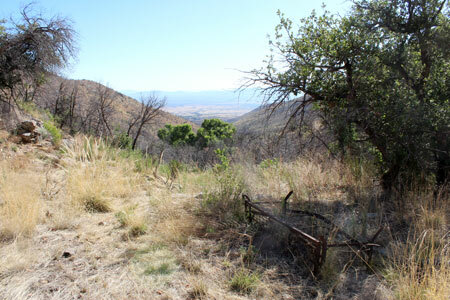 There is one report that he had dealings with Wyatt Earp and his brothers over the mining properties that they owned. Through its hardware department, the company was a supplier of all types of mine equipment. If a customer needed an engine, a compressor, rock drill, ore car, cable, nails, or timber it was all available. 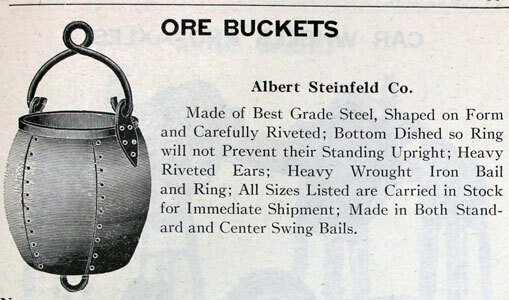 Albert Steinfeld & Company was a jobber for the national brands of the day like Fairbanks Morse and Sullivan. 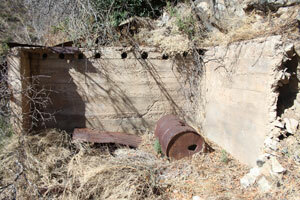 Mine equpment of original design was manufactured in its machinery department. There was an engineering staff, a machine shop and foundry. 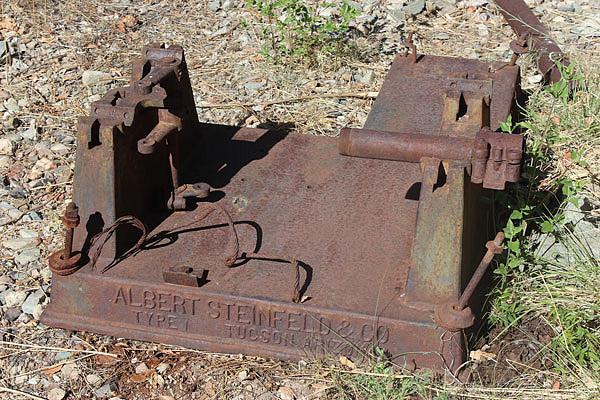 It was that machinery department that was the connection to the mine relic in the Huachuca Mountains and the name cast into it of "Albert Steinfeld & Company". 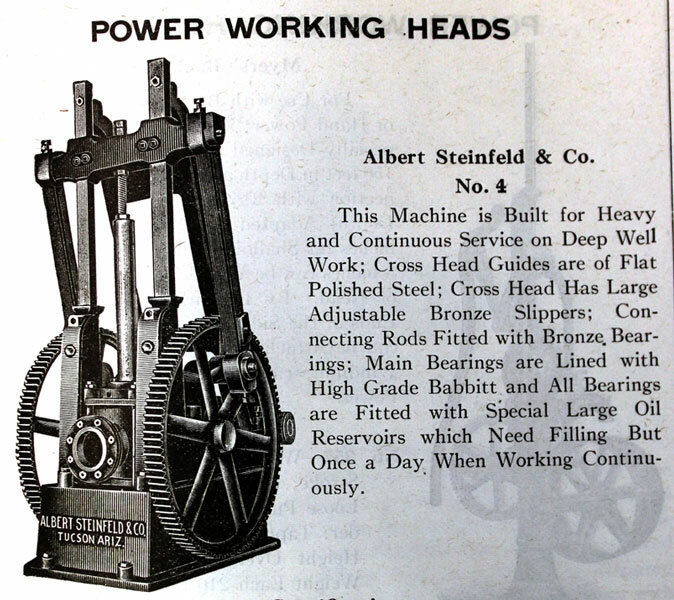 A lucky find of a 1920's Albert Steinfeld & Co. Wholesale Hardware and Machinery Department Catalog at the University of Arizona's Special Collection Library provided more information on the machinery manufacturing aspect of Mr. Steinfeld's enterprise. In addition to the listing of the thousands of hardware and machine items that were for sale, the capabilities of the Machinery Department were described. 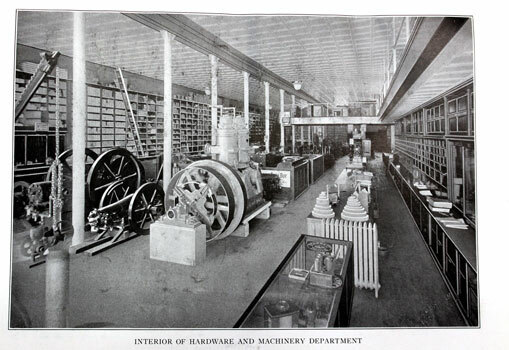 Also included in the catalog were photos of the various facilities associated with the hardware and machinery business. The sign on the building says "Tucson Iron Works". My dad remembers the business still in operation in the 1940's. 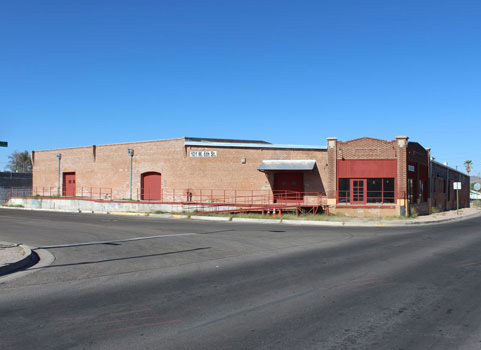 It was located on the southside of Tucson on Fair Street. There is a more modern metal fabrication plant located in the area today. I do not know if it is on the grounds of the Steinfeld plant or not. The foundry was erected around 1910. 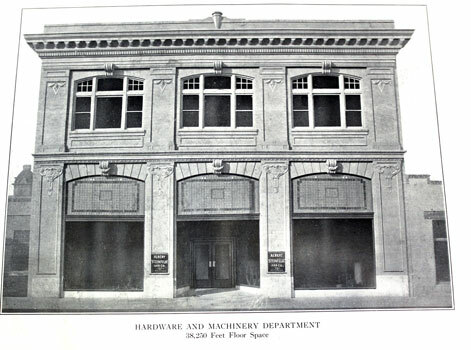 The location of the hardware store was in downtown Tucson near the department store. Its address was 175 N. Stone Ave. Today, the new public library stands in its place. It was reported that the Steinfeld business complex at one time covered 3 acres. The intersection was Stone Avenue and Pennington Street. The dome seen to the left of the exterior view of the store was probably that of the original county courthouse. 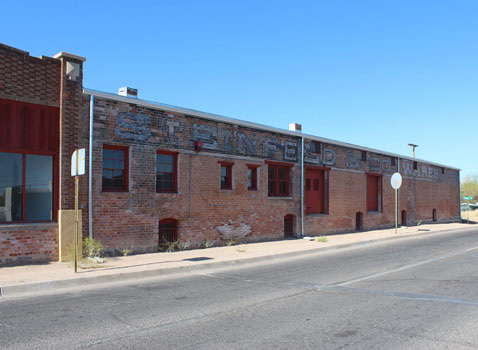 The main warehouse was located in downtown Tucson near Stone Avenue and 6th Street near the Southern Pacific Railroad tracks. It still stands today and has changed little on the outside from when it was constructed in 1907. I believe that it is on the National Register of Historic Places. I have not been able to determine the location of this warehouse and do not know whether it still stands today. As was stated above, the company also sold items of their own design and manufacture. The items below are examples of equipment that originated in the Tucson plant. As for the old piece of mine equipment, the illustration of an oil engine mine hoist in the catalog seems to show very similar parts. It is of Steinfeld design and manufacture with the addition of a 3 H.P. Fairbanks Morse Engine. A similar electric hoist was also produced. The drawing does not exactly match the relic, but the description does mention that the hoist came in a version that could be "sectionalized" into pieces for mule transport. Perhaps the illustration is of that version. There was no price listed for the machine. That depended on the application/accessories. The Hardware Department remained open until the late '40's early '50's when it was sold to the Arizona Hardware Company. I do not know when the machinery/foundry department changed hands. 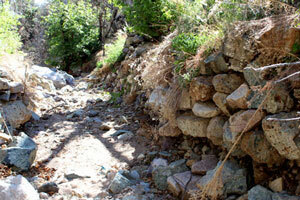 There are interesting rock walls at the site where it appears that the miners were trying to channel/control the flow of the creek or stabilize its banks. The author of the "Trails of the Huachucas" hiking guide speculates that a large gulch nearby may have been the result of "hydraulicking". 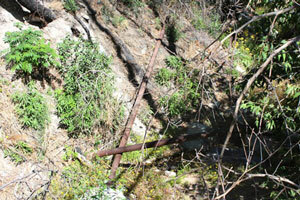 There are quite a few lengths of 4" diameter pipe scattered around. The area had been recently burned, and it was not easy to maneuver around the area. Poison Ivy in the creek bottom, kept me from exploring upstream from the site. There were nice yellow columbine flowers amongst the poison ivy. A great view down Ash Canyon was to be had!